This title suggests that I bought something at the thrift shop recently. It was actually an estate sale find, but I couldn't resist this fun title. Ben and I don't really listen to rap music, but "I'm wearing grandad's clothes, I look incredible" has been Ben's life motto since early high school so we sing this song to each other occasionally. Couldn't resist. Anyway. Check out this little baby. 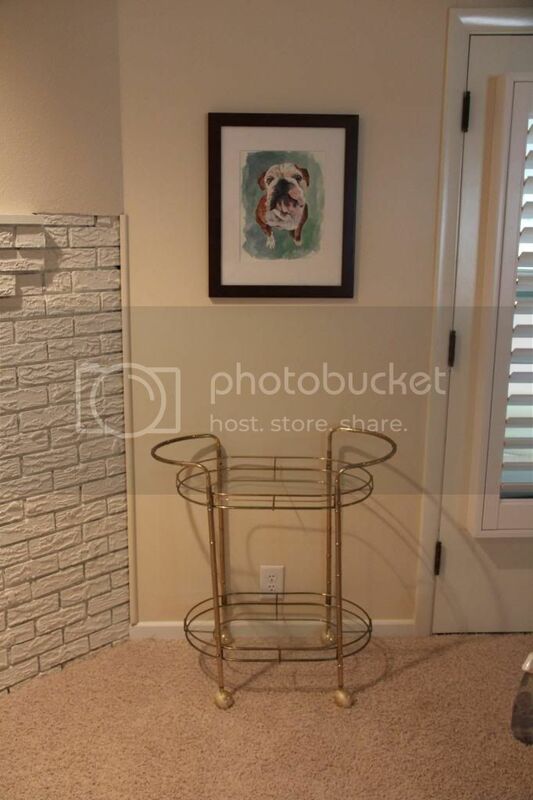 I have recently loved seeing photos of styled bar carts on Pinterest and in Williams Sonoma, etc. One teeny tiny problem. Okay, two teeny tiny problems. Problem one: As newlyweds, we aren't exactly financially equipped for this guy from WS. A thousand smackaroonies could go a lot farther and on a lot more practical things than that cart. Problem two: We don't really drink. We aren't against an occasional glass of wine together at home, but as far as our actual life.. we just aren't drinkers and don't believe that displaying alcohol in our home lines up with what we want to portray to people who visit us. If you have any more questions about that, feel free to email me. Holla. So basically we had zero dollars and zero practical need for a bar cart. But when we walked into an estate sale and found our new little baby marked down 50% to just a mere $15... things change. I actually "ummm-ed and ahhh-ed" a little bit but Ben knew I wanted it so kinda pushed me. And boy am I glad he did. I decided I wanted to make this little spot welcoming for visitors. When someone comes into our house, I want them to feel like they are special and loved. And don't tell me you wouldn't feel special and loved if you were given a flavored soda and a Dove chocolate upon visiting someone's casa. I put some striped straws in a textured cup from Anthropologie, some chocolates in a small bowl (also from Anthropologie), some of our favorite stemless glasses, some Izze soda and some sparkling water. I wanted the water to be in real bottles but no where around here that I looked had that. Oh well, those bottles were only like a dollar because of it so I'm fine with that. 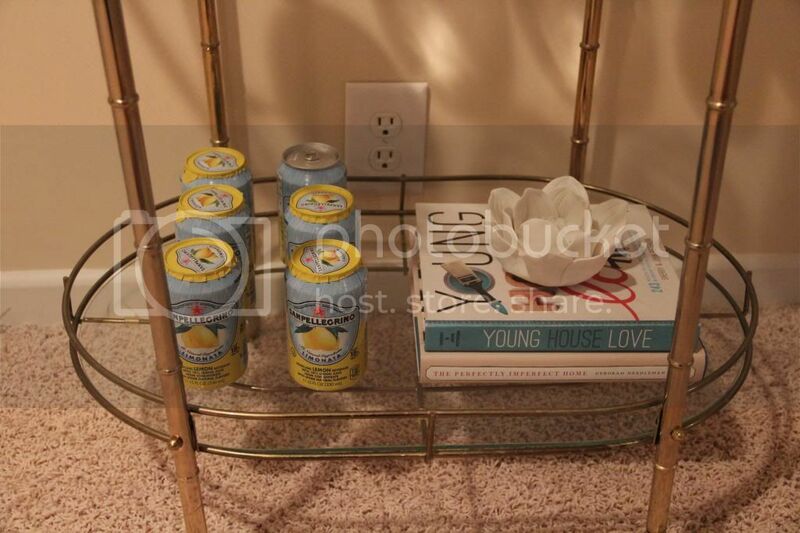 Flavored sparkling water, two favorite design books, and a ceramic flower votive holder sans votive. Also, forgive me for not editing these photos. Squint a little bit. 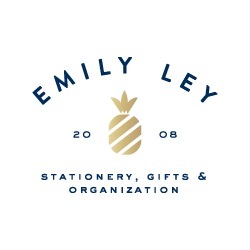 Please excuse me while I just become obsessed with your blog. 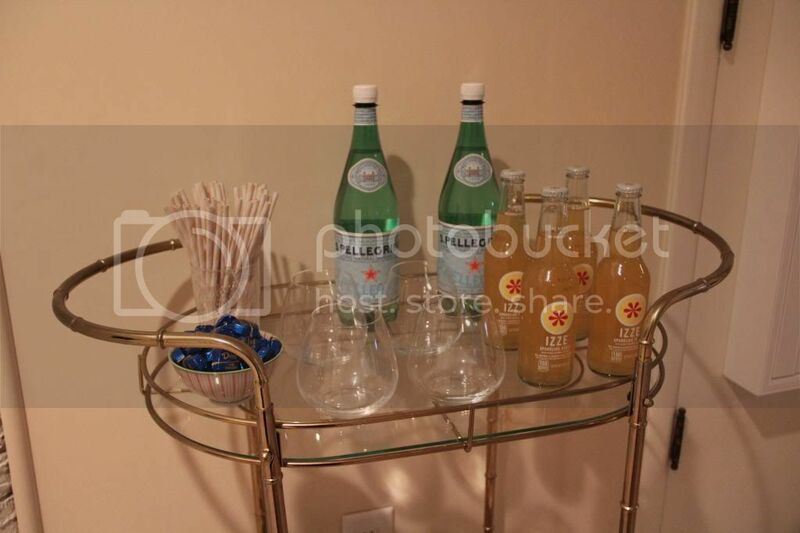 I love that you put Izze's on the bar cart. 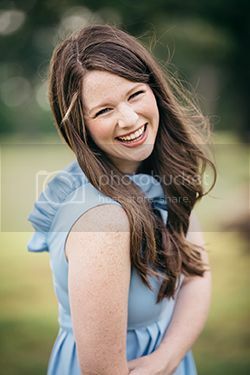 You're so cute! It is super cute! People know I drink, but even I (a proud scotch man), love what you did with the repurposing. 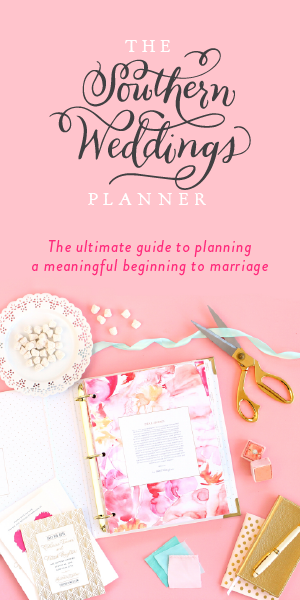 So classy, creative and cheap! 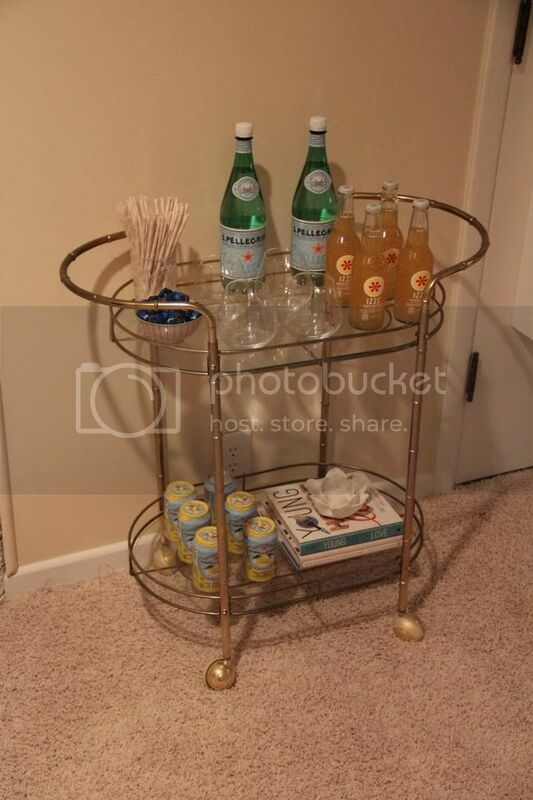 I love what you did with the soda/chocolate bar cart. That is really stinkin' cute! We're not big drinkers either, except for a glass of wine here-and-there or a beer for my hubs with his friends. The sparkling water and soda idea is great. 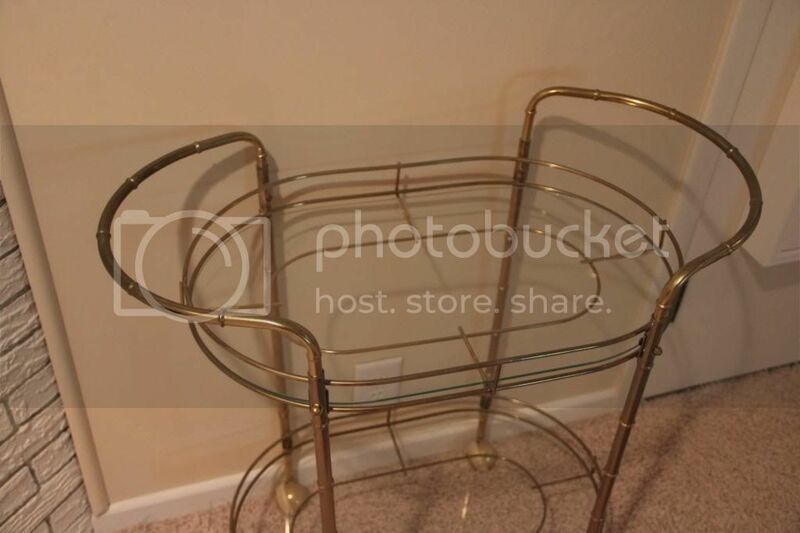 I wish I could steal it, but we have no where in our house for a soda/chocolate bar cart. SO CUTE!! 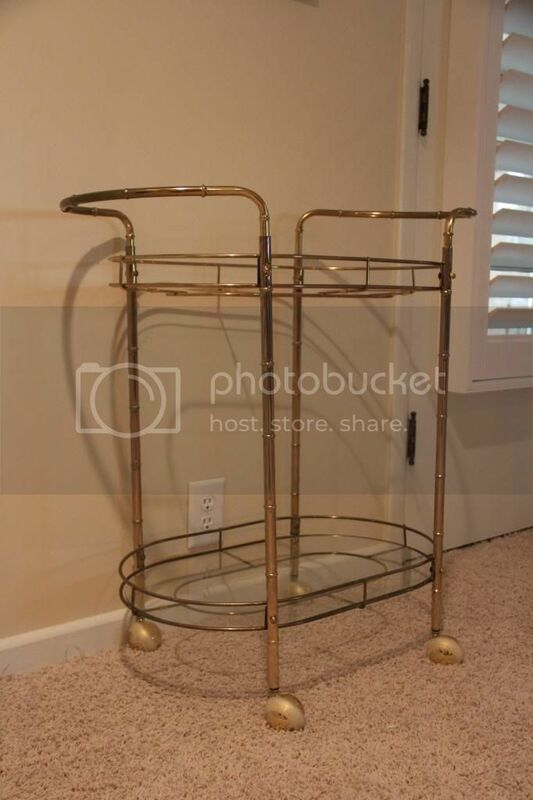 Like y'all, we aren't really drinkers, so displaying alcohol doesn't make the most sense, but that hasn't stopped me from wanting a bar cart! GREAT find for $15!